Vancouver based photographer Douglas Curran first met members of the Chewa people of Malawi--the second-to-last country on earth to receive television--while working on a film in Zimbabwe in 1992. The Chewa he met were migrant workers employed on plantations and in mines. Over several years he gradually became integrated into the Chewa community in Malawi and became the first photographer to document their rituals and sophisticated masks associated with a belief system known as Nyau. The Nyau (meaning mask) is also a term for a semi-secret mask association of men. The Chewa rituals and their stunning masks are part of a complex and spectacular set of beliefs that Curran was encouraged by the Chewa to record. "The Chewa believe Chauta (God) descended to earth with man, woman and all of the animals," writes Curran. "All lived in harmony until the day man accidentally created fire by rubbing two sticks together. With the grasslands and the forest aflame, all the animals (with the exception of the dog, the goat and the pig) ran away in fear and anger. From that time forward, there has not been harmony in the world." Curran's pictorial record served as the basis for an astonishing exhibit that opened at Presentation House Gallery in North Vancouver in January called The Elephant Has Four Hearts: Nyau Masks and Ritual. 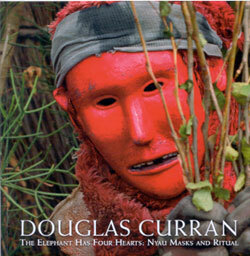 An accompanying book-length catalogue was published as Douglas Curran: The Elephant Has Four Hearts: Nyau Masks and Ritual (Presentation House, 2005). The exhibit was curated by Bill Jeffries.